I was feeling good about this Xbox One controller to play games on my Windows 10 PC. I was able to play Terraria with no problem, I played Lego World’s, both from Steam, and I was even able to play Minecraft Windows 10 Edition Beta with no problem. Well, I was having one problem, the problem was getting Minecraft Windows 10 Edition Beta to load. The darn game just wouldn’t load properly. So I thought ok, what now? I mean, I do have Minecraft PS4 and Minecraft PS Vita, and I even have Minecraft Pocket Edition on my Nook HD+. Now I have Minecraft Windows 10 edition, which is basically a mobile version of Minecraft, but I couldn’t play it, so I thought screw it, I wanted to buy the PC edition anyway, so I bought it and wouldn’t you know the Xbox One game controller wouldn’t work. How frustrating is that? I went to Google and asked how I can play Minecraft PC with a Xbox One controller and the first couple things that came up were videos. One said to install the Xbox One drivers, which I don’t need to do since my computer recognizes the controller immediately. I have yet to feel a rumble, so perhaps I will need to install that anyway. Next they said to downloaded JoyToKey and the guy had all the commands in the description for his video. It didn’t have every key correct though, so I was able to find the keyboard/mouse command so I could fix that problem. Now the Xbox controller works perfectly, except for the inventory. I can go into the inventory, I just have to use the mouse to craft with, but that’s fine. My only concern was that I was able to use the game controller to play the game. UPDATE: Ok so installing the Xbox One driver was an extremely bad idea. I think the driver is specifically for people who want to use bluetooth. The Xbox One logo on the controller is normally lit, but after I installed the driver, that light turned off. It’s a button, so I pressed the button and the light would blink on and off for probably a minute, then it would shut off. I loaded Terraria and the controller was non-responsive. I went into the Device Manager and uninstalled the driver, then rebooted my computer, and waited with anticipation for that light to come on. I actually started to panic when it didn’t come on because I thought great, now I have to reformat this thing, but then the light came on and I played Terraria and it was fine. WHEW! The first couple of days using Windows 10 was a learning experience, and things have gotten a lot faster since I started. The Start window comes up immediately now and when I click All apps, the list of apps comes up right away, although, there are times when it takes a few seconds longer, but I’m patient. Now the only thing that still concerns me is Microsoft Money. Someone tweeted me a link to a blog that tells me that all I have to do is go into my Registry and change something, which isn’t always the best idea, especially coming from a stranger. Oh sure stranger, I’ll screw things up even more, thank you. And the sad thing is I went into my registry and looked for that string, but it wasn’t there. I’m actually glad I didn’t find it because it would’ve been a disaster if I screwed things up and had to start over again. I hope Microsoft comes up with an update to fix this issue so I can use MS Money again. This is the error message I am getting when I load MS Money. When I started using Windows 8.1, I wasn’t using the browser to use Facebook, Facebook Pages Manager or Twitter, I was using the Windows apps instead. Gradually those apps stopped loading quickly until they just stopped loading at all. Eventually I had to go back to using the browser. 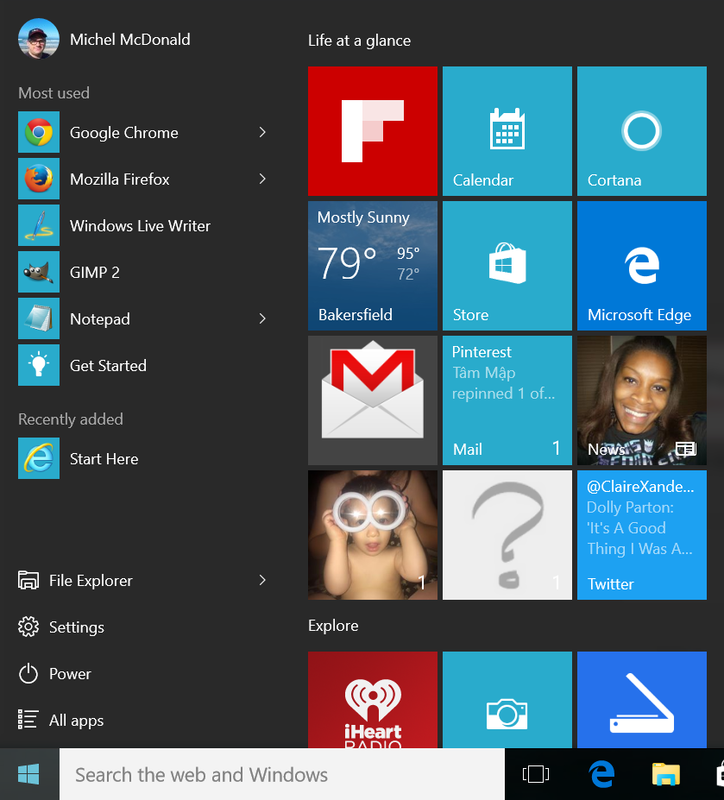 When I installed Windows 10, those apps load quickly, and in a small window. In fact, all of the apps, including Windows Edge, their new browser, all open in a small square window. I have a widescreen monitor, not a square one, not that Windows really cares. But still, when I use Edge, I have to stretch it on both sides to see everything on the website. When I close the website and Edge reloads when I click a link, it opens in that square box again. Not that that is a real issue for me, I don’t really care about that. I’m not bitching about anything, I’m just saying this is what’s happening when I open Edge. I had mixed feelings before installing, and I was outraged after I installed, but I’m warming up to the new version of Windows and believe it or not, I’m happy I installed it. For anyone who just installed Windows 10 without burning it on a DVD, you should probably think about downloading the ISO file for both 32bit and 64bit and burning them to a DVD or putting it on a USB drive. They give you both options. You’ll regret not doing so if/when the day comes when you have to reformat or even if you buy a new hard drive and you have to reinstall Windows 8.1 and then upgrade back to Windows 10. 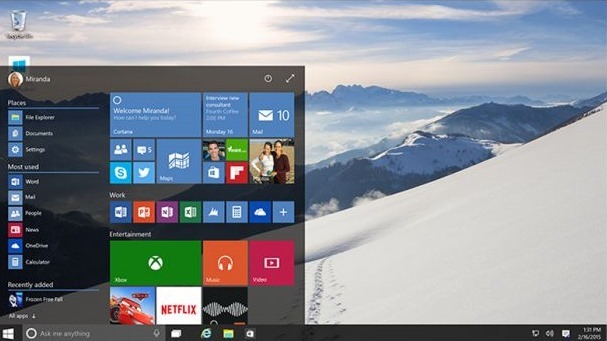 After a year, you won’t have the option to upgrade to Windows 10 for free. It’s just a suggestion, and trust me, you will thank me later.